For awhile I entertained thoughts of running away to Greenwich Village in New York City and becoming a folksinger. I thought maybe it could be "Peter, Paul, Mary and Linda." Or maybe I could be an artist. I did this drawing with pastels in the 8th grade. I thought I was so cool, using subdued colors. I felt I was better clued in than my classmates to the essential gloominess of life. 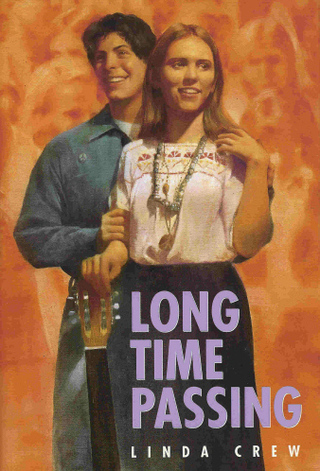 This bit found its way into "Long Time Passing." I entered the famous Seventeen Magazine Contest as an artist, not a writer. Hey, you had to write 2,000 words for the short story contest! Who could do that? For at least two years I was fiercely determined to become an actress. 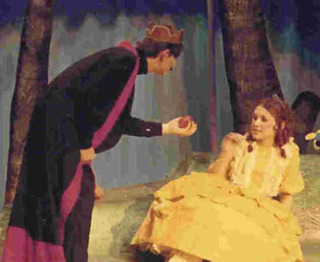 Here I'm playing Princess Persephone with my pal Gary Beach (Gary, where are you? )as the Evil King of the Underworld. Our drama director's wife, Pat Malango, wrote the play. She had several published plays and collected royalties on the various productions of her works. She seemed to like the way I played her lead character. I confess that I didn't understand what this meant to a writer until years and years later. At the time, I was simply enjoying my twelve petticoats, bouncing Shirley-Temple-type curls, and having a golden spotlight follow me around the stage! It never occurred to me I might someday be a writer myself. When my oldest son hit the age of sixteen, it brought back a lot of memories about my own teen years. I realized I had probably not been the easiest kid to raise, especially when I reached that wonderful age where I saw that the world was not perfect and figured people would want to hear my opinions on this subject. In writing about being this age, I ultimately decided to stick to my own era where I could be confident about the details. And 1968 was such a year! All the assassinations, the War in Vietnam, the unrest and turmoil in the streets... Ours probably wasn't the only house where the generations divided at the dinner table over politics. Against this backdrop, I wanted to write about a girl exploring her talents and finding her way to becoming a writer. Kathy Shay's story isn't really mine. I had no high school boyfriend like James. But there's a lot of me in her and many of the incidents and details are things that happened to me, or somebody in my family somewhere along the way. In the book, Kathy and James play Mary Warren and John Proctor in "The Crucible." This was my favorite part ever. At that time in my life, there was nothing more fun than going to rehearsals every afternoon, getting up on the stage and screaming my head off in the girls-get-hysterical scenes. Kathy's school puts on "The Miser," by Moliere. This is the cast of the Corvallis High School production of the play in the spring of 1969. I'm in yellow in the front.